01:15:00 Makes 6 servings. 2 stuffed shells (330 g) each. Makes 6 servings. 2 stuffed shells (330 g) each. No matter how busy the day gets, people still need to eat. We recommend this Triple-Cheese Spinach Manicotti: you can make it ahead of time to get a jump on dinner. 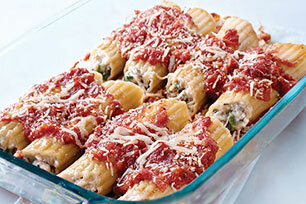 Serve this oven-baked manicotti with a bagged salad and you’ve got dinner all wrapped up! Meanwhile, cook bacon in large skillet on medium heat 4 to 5 min or until crisp. Use slotted spoon to remove bacon from skillet, reserving drippings in skillet. Drain bacon on paper towels. Add onions and garlic to drippings; cook and stir 2 min. Add ground beef; cook and stir 6 to 7 min. or until no longer pink. Stir in bacon, cream cheese spread, spinach, mozzarella and herbs. Drain pasta; fill with meat mixture. Mix sauce and water; spread 1 cup onto bottom of 13x9-inch pan. Top with shells. Pour remaining sauce over shells; cover. Bake 45 min. or until heated through, uncovering after 35 min. Top with Parmesan. Assemble manicotti as directed. Refrigerate up to 24 hours. When ready to serve, bake in 350ºF oven 55 min. or until heated through, uncovering after 45 min. Serve with a mixed green salad tossed with your favorite light dressing. Serving Size Makes 6 servings. 2 stuffed shells (330 g) each.